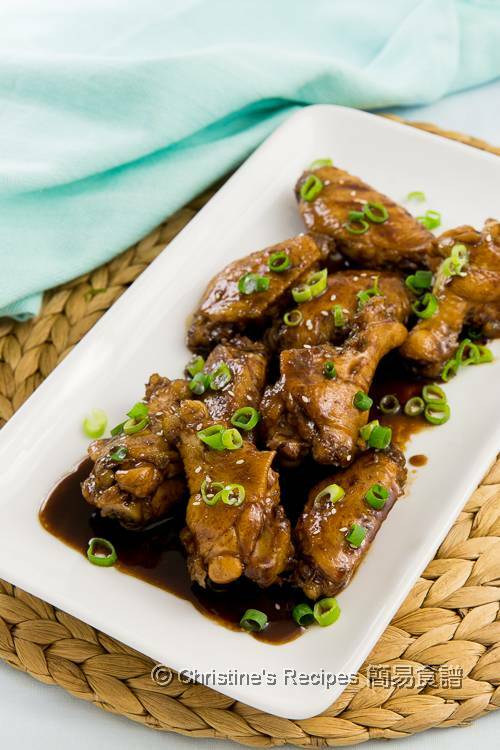 Combining Chinese light soy sauce, Italian Balsamic vinegar, Thai Sriracha sauce and fragrant honey, this chicken wing dish is so flavoursome. There are countless methods of cooking chicken wings. It could be Asian, Western or Asian-Western fusion ways. No matter what way I use, I aim to get the best taste to feed my family. 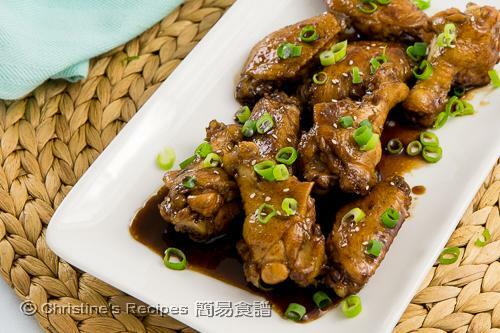 Combining Chinese light soy sauce, Italian Balsamic vinegar, Thai Sriracha sauce and fragrant honey, this chicken wing dish is so flavoursome. Top left: Balsamic vinegar and honey. The family didn’t want to waste a tiny drop of the honey-balsamic sauce on the plate. Mix honey, balsamic vinegar, soy sauce and Sriracha sauce well. Set aside. Heat a little bit of oil in a wok over medium heat. 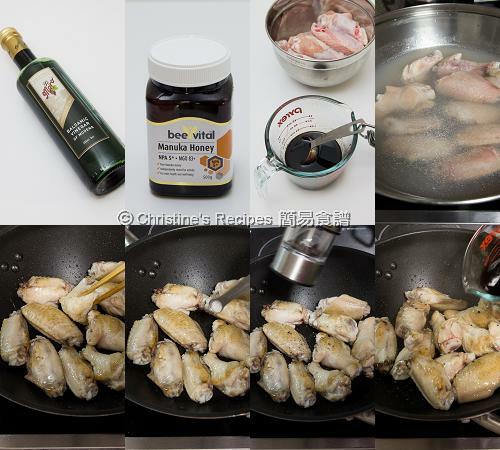 Pan fry chicken wings until both sides are lightly brown and release oil. Use kitchen paper to absorb excess oil. Push chicken wings to sides of wok. Saute garlic in the middle. Season with salt and pepper. Stir to combine. Pour in the honey mixture in wok. Bring it to boil. Cover and reduce heat to simmer until chicken wings are cooked through and softened. Remove the cover. Increase heat to high. Cook until the sauce is reduced by half. Add thickening and cook to your preferred consistency. Garnish with spring onion and sesame seeds. Serve immediately. Balsamic vinegar is available at supermarkets. Its rich taste of sweetness and acidity goes so well with honey. Try to get good quality honey. Its aroma brings the whole dish up a level. Pan-frying the chicken wings helps release oil and makes the dish healthier. Sriracha sauce is available at Asian grocers. Tangy and sweet...I love these chicken wings!